Luddism for Fun and Profit - Kellbot! | Kellbot! One of the things I’m doing this January is revamping how I handle shipping. Which means investing in a little bit of hardware. I picked up a nice USB postage scale to replace the food scale I’d been using. Aside from more precise measuring, it interfaces with my shipping software to automatically enter the correct postage amount. And I’m viagra next day delivery finally graduating from sheets of Avery shipping labels to a thermal printer. But let’s back up a second. 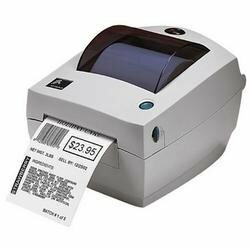 Let’s talk about thermal printers. Specifically, the LP 2844. The Zebra LP2844 is an exceptionally common printer. Both UPS and DHL give them out to their shippers, and provide free labels for them. They’re fairly compact, versatile, and since they’re thermal there’s never any ribbon or toner to replace. All in all a decent little printer. Unfortunately I do most of my shipping through the US Postal Service, who don’t seem to have any interest in rewarding me with free hardware. There have been a number of iterations of the LP 2844 over the years. DHL has their own bright yellow branded one, and the new ones have entered the modern age and now support USB. Which means there are now a ton of the older ones for sale on Ebay. The current models go for about $400, but if you’ve got a machine which still sports a parallel port, you can grab an older one for $40. If you’re not the sort of person who keeps a parallel port around for kicks, but have an open PCI slot, you can get a parallel card for about $15. They even throw two USB ports on it so you don’t feel like a total chump. The printer also supports serial, so in theory if you have a USB serial adapter lying around (most good hackers do) you could use that. But the data transfer is so painfully slow it’s not something you’d ever want to use in production. I’ve also seen a few USB to parallel cables, but reviews on those are mixed. Apparently getting the drivers happy is a bit of a pain. So thanks to my Luddite boyfriend, who insists on purchasing motherboards which still have parallel ports, I was able to get a super cheap label printer. That coupled with my new scale should make the whole postage printing process much faster and smoother.